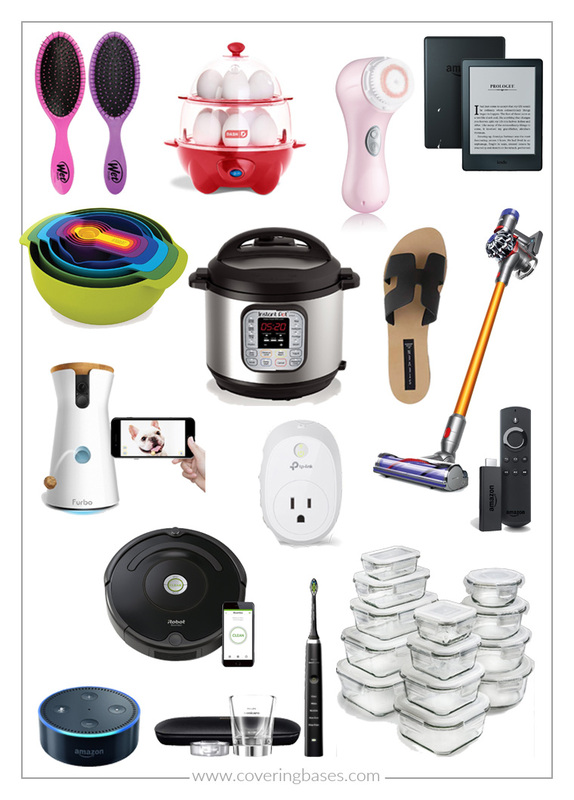 You guys already know how much I love Amazon and you also know that today is the last day to shop the big Amazon Prime Day sale! They have a TON of markdowns on a lot of really great items and I wanted to share what I have and love and a few other goodies that I picked up in the sale! 2. Dash 12 Egg Cooker -- I got this for Andrew because we're trying to be more adventurous in the kitchen with the meals we create and have only heard really great things about this product! 3. Clarasonic Mia 2 -- Always a classic to snag for yourself or as a present for friends -- it does wonders for the skin! 4. Amazon Kindle -- I got this for my birthday in May and although I still prefer books, I like having this in my bag so I can read for those times when I'd instead just be on my phone like commuting, waiting at a drys apt... things like that! 5. Nesting Bowls -- This was a recent purchase and I think it's so fun to have for any kitchen. Space is limited in my apartment so the fact that these all stack so nicely in one another is a huge plus for me! 6. Instant Pot -- Andrew got this for Christmas last year and is one of our very favorite items to use when cooking meals! We've made so many great things from it already and I LOVE all the recipes there are online for how to really make the most of it! 7. H Sandals -- These sandals (that come in like 10 colors) are *the* summer shoe this year! 8. Dyson V8 Vacuum -- Easily hands down my very favorite thing I own. I cannot tell you how nice it is to have a vacuum that is cordless and easy to use and switch out/around. It's GAME CHANGER. 9. Furbo Pet Camera -- We use this for Dixie but it's really meant for dogs -- so really any pet owner will be able to use it! It's just a one way camera that connects to your phone so you can check in on your animal when you're not around. You can talk to them and also feed them treats! 11. Amazon Fire Stick -- This makes any TV a smart TV and you can watch all your favorite shows and movies through this device! 12. iRobot Roomba -- One of my wish list items for whenever we have a bigger place. It would just be so nice to have to follow Dixie around so there wouldn't be so much hair everywhere.. especially right now UGH the summer shed is HERE. 13. Amazon Echo Dot -- I have the Alexa and the Dot (one in each room) and I mainly use her to play music, set alarms/timers, play Jeopardy and ask about the weather. It's not the most used thing in the apartment but she does come in handy and I realize I miss her when she's not around! 14. Phillips Sonicare Electric Toothbrush -- I'm in the market for a new toothbrush and this set is NICE. Plus at 50% there's very little reason to not try it out!! 15. Glass Storage Containers -- I'm trying to reduce the plastic in our apartment and especially around our food so I got this 13 piece set and I love it. It feels more fancy than the price but I've noticed our food stays fresher longer and that is the ultimate goal here!